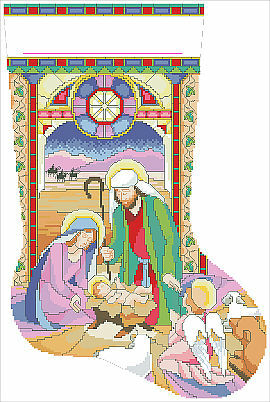 The Nativity Story is depicted on this lovely stained glass inspired stocking. The beautiful scene is a stirring reminder of the birth of the Christ child. This chart Pack is printed in full color with easy-to-read symbols and graphs. Each chart pack comes with a full color image, chart, DMC floss color guide and general directions. PDF DOWNLOAD - Each PDF download includes a printable chart, general instructions and DMC color floss chart. Contents: Stocking measure 147 stitches wide by 221 stitches high. If stitched on 14 count the project would measure 14.5" high by 15.75 high.